Ayahuasca is a hallucinogenic Amazonian plant concoction that has been used, often as a sacrament in religious ceremony, by native Indian and mestizo shamans in Peru, Colombia and Ecuador for healing and divination for hundreds, perhaps thousands of years. The name is from the Quechua language: huasca means 'vine' and aya means 'souls' or 'spirits'. 'Vine of the spirits' would be an appropriate English translation. Many Western trained physicians and psychologists have acknowledged that these substances can give access to spiritual dimensions of consciousness, even mystical experiences, indistinguishable from classic religious mysticism. Ralph Metzner has been at the forefront of the field of consciousness studies for over 35 years, beginning with his work at HArvard University with Timothy Leary and Richard Alpert on the possible therapeutic application of psychedelic drugs. 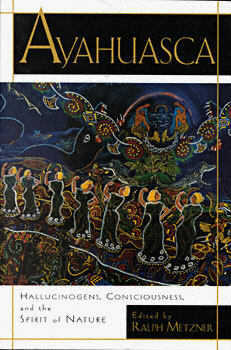 In this book he has assembled a diverse group of contributors who provide an exploration of the chemical, biological, psychological and experiential dimensions of Ayahuasca -- one aspect of the revival of interest in shamanism and sacred plants as part of the worldwide seeking for a renewal of the spiritual relationship with the natural world. Ralph Metzner, Ph.D., holds a doctorate in clinical psychology from Harvard University where he has also been a postdoctoral fellow in psychopharmacology. He is the co-author of The Psychedelic Experience (1964), and the author of Know Your Type (1979), Opening to Inner LIght (1986), The Well of Remembrance (1994), and The Unfolding Self (1998). A forthcoming collection of essays, Green Psychology, will be published in 1999. He is professor of psychology at the California Institute of Integral Studies in San Francisco.